Maybelline Colossal Smoky Eyes Mascara - $8.99 - a companion product in blackest smoke, scorching brown and blue blaze to match the Master Smoky Longwearing Shadow Pencils with a collagen-enriched formula and unique matte shadow pigments for smoky dramatic volume. 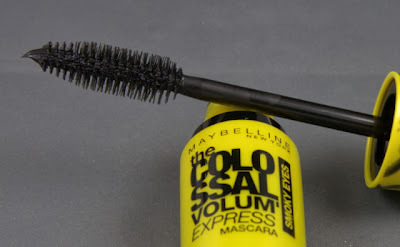 It has nice definition but I wouldn't say it was the most volumizing mascara I've ever tried. But I do like the matte finish - which I think makes it much more wearable as an everyday "dramatic" look. You can get a better sense of the matte finish here (please excuse the escaped bang bits) - mascara usually looks shiny when the light hits it but this isn't at all!